Bette Waters offers a new book, published in January of 2015. Curves, Points and Hair is a Memoir of a Nurse Midwife which describes highlights her life as a nurse midwife, writer and publisher. The book is currently available at Amazon and Barnes & Noble. So, What About the Nausea? So, What About The Hormones? So, Who Says You're Fat? So, How Will I Know It's Labor? Bluwaters Press is a small press catering to authors who need editing and publishing help. We do both book design and book cover design. Bette Waters, owner of Bluwaters Press and a writer, editor, publisher, and nurse-midwife, says a less than satisfactory relationship with the publisher of her first book led her into the world of publishing. After experiencing erratic payments and communication, Ms. Waters concluded she could do at least as good a job at publishing as what she was experiencing. So she set off on her own course. Establishing a relationship with a fabulous printing company in El Paso, Texas was the beginning of Bluwaters Press. 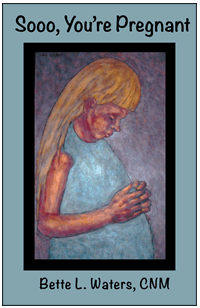 We published our first book in 1998 -- the Second Edition of Massage During Pregnancy, which is now in its Fourth Edition. Since then we have published 22 books, setting up an imprint publishing for Whoa You Donkey . . . Whoa! by Laura Leveque; Dear Family, Letters from Nigeria by Gayle Lewis; Autopsy of A Soul by Rev. Maria Reynolds; Then He Said ... by Howard Scott (deceased 2008); El Perdido: The Lost One by Randy McCowan; and The Roosevelt Gambit by G. B. Eubanks. Please look over our book offerings by clicking on the book covers in the image scroller to the left. Each image will take you to a page which features a book review and ordering information.